Isn’t puff pasty an awesome gift from the food Gods?!! I may be exaggerating, but seriously, this stuff is so good. It’s savory, it’s sweet, and can make whole meal in no time at all, what is not to love? 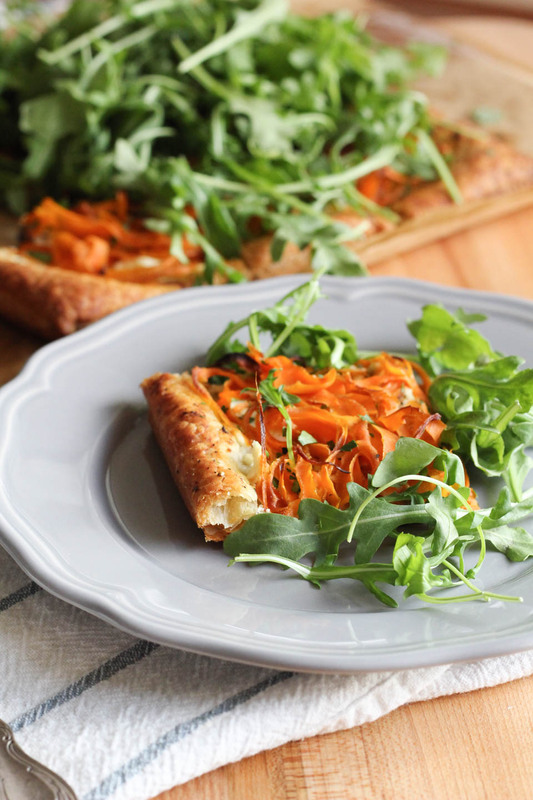 Goat Cheese Carrot Tart with Arugula came from a few recipes mashed together. I was making savory galettes, and tarts and wanted something a little easier. That is when the puff pasty popped into my head. While I love making galette dough, I also have a puff pastry sheet on hand in the freezer most of the time. We had this for dinner with a pile of extra arugula, and I roasted some chicken sausages after baking the tart, for filling protein. It was a nice, easy, delicious dinner. 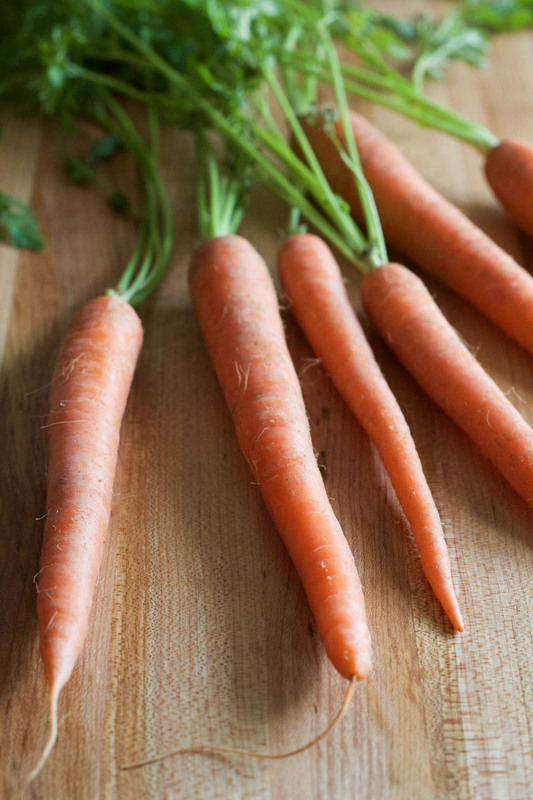 You could totally add slices of sausages on top of the carrots, for an even easier dish! It really rounded out this simple meal for our weeknight dinner. 1. Thaw frozen puff pastry sheet on a parchment lined baking sheet for 10 minutes. 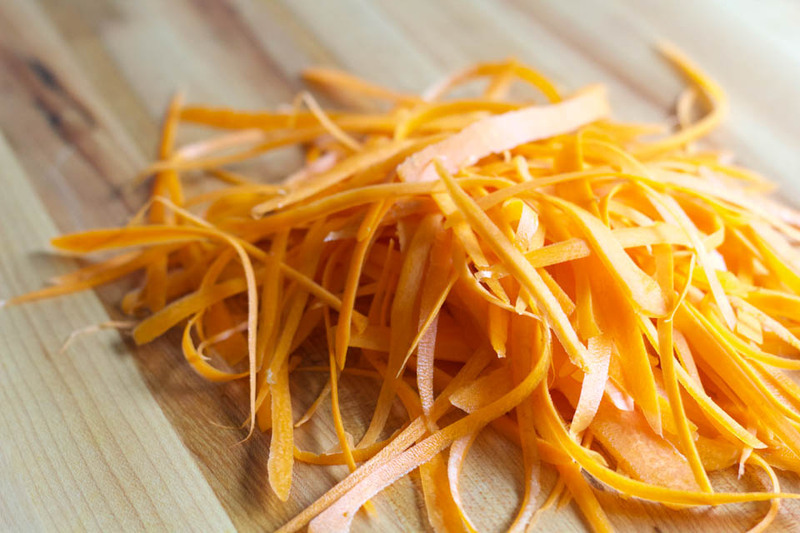 While thawing, take a vegetable peeler, and peel each carrot into ribbons. Place ribbons in a medium bowl and toss with 1/2 tablespoon olive oil, the balsamic vinegar, honey, 1/8 teaspoon salt and pepper. 2. 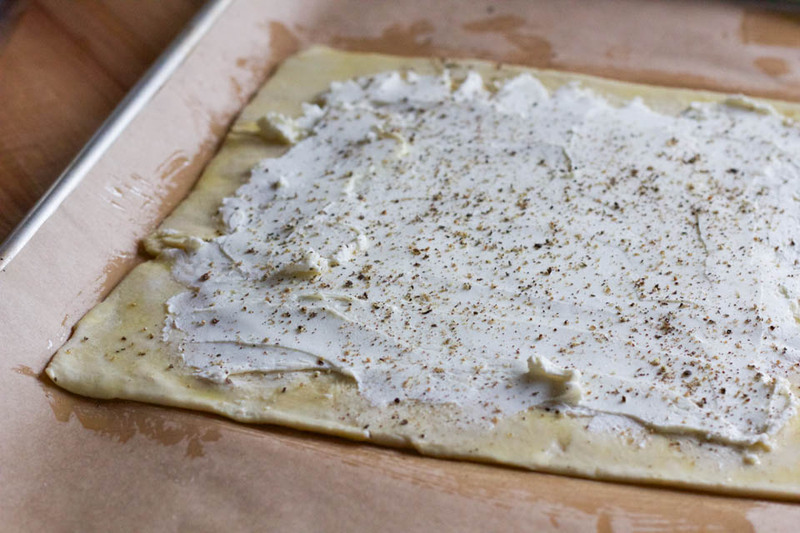 Brush 1 tablespoon olive oil over entire pastry sheet. Using an offset spatula or spoon, spread goat cheese evenly on pastry sheet, leaving a 1/2 inch border all around. Sprinkle with 1/2 teaspoon black pepper. 3. 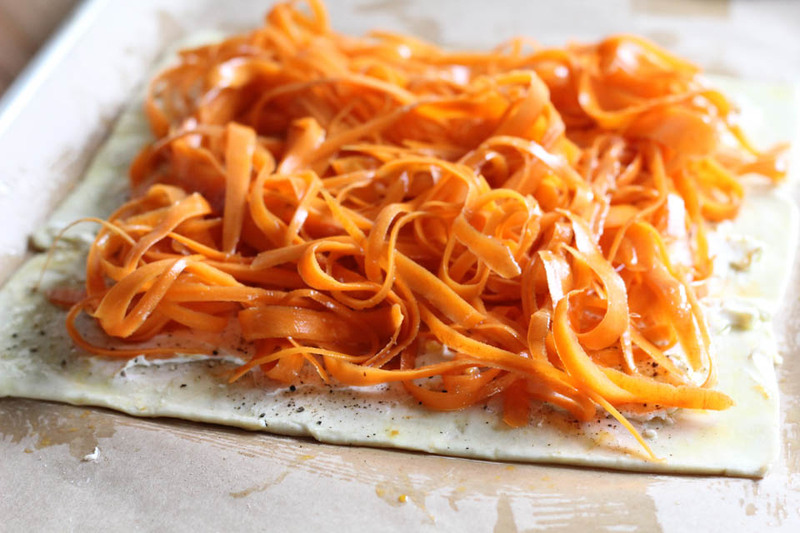 Place ribbon carrots on goat cheese, leaving the same 1/2 inch border around. Place in oven and bake for 20 minutes or golden brown edges. 4. Remove and allow to cool for 5 minutes before slicing. Sprinkle fresh parsley over tart. Cut into 9 even pieces. 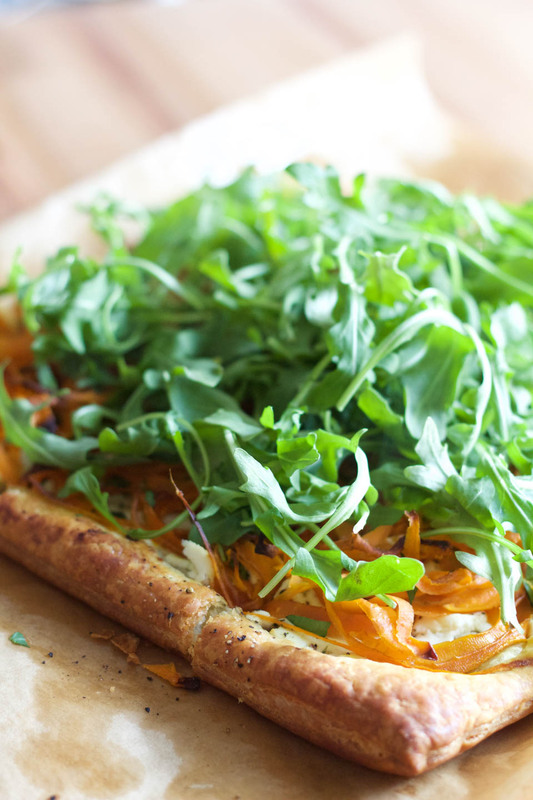 Serve with arugula, or place a pile of arugula on top of the tart then serve. What a beautiful tart, and so easy too! You are so right about puff pastry! Love this gorgeous dish and all the veggie love going on there! Puff pastries are AMAZING! Love the flavors on this one. Thank you so much for the link love!! 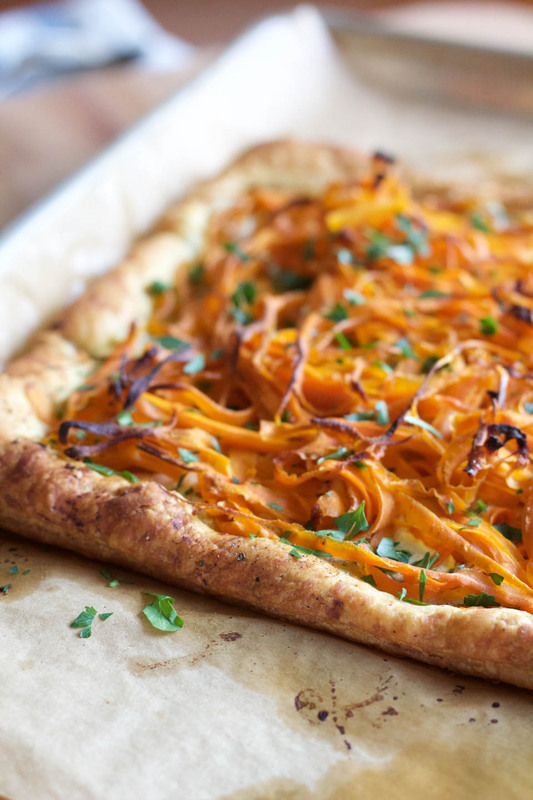 your carrot tart is gorgeous!!!! I love this!!! I LOVE carrot ribbons! Of course, it’s such a great recipe you have! Thank you!